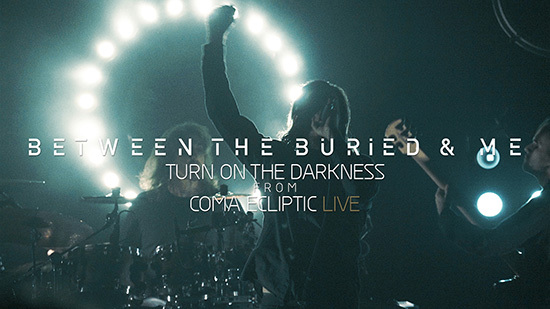 BETWEEN THE BURIED AND ME launches live video for ‘Turn on the Darkness’, from new DVD/Blu-ray, ‘Coma Ecliptic: Live’! Hailed as “a 68-minute cosmic opera” (Rolling Stone), ‘Coma Ecliptic‘ was released in July 2015, debuting at #1 on the Hard Music Billboard Chart, #12 on the Billboard Top 200, as well as #1 on the iTunes Metal Chart, Vinyl Chart, Amazon Hard Rock Chart, and Amazon Metal Chart. Additionally, the album charted on the iTunes Rock chart (#2), Canada Hard Music Chart (#3), UK Rock/Metal chart (#4), UK Independent Chart (#10), Canada Top 200 Chart (#17), Canada Top 200 Digital (#22), Germany Top 100 (#53) and UK Album chart (#74). The upcoming DVD/Blu-ray for ‘Coma Ecliptic: Live‘ will surely please fans once again, with the must-see visual component added to the already acclaimed album. Directed by Vince Edwards and edited by Blake Faucette and Justin Reich, ‘Coma Ecliptic: Live”s audio was mixed by Jamie King at the Basement Recording NC, with live GoPro camera placement by the band’s own Blake Richardson (drums).